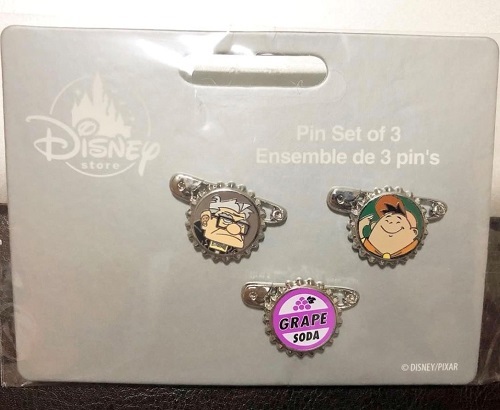 So, I was both happy and sad that there weren't many Up pins previewed for Pixar Fest but someone posted a clearer picture of the Pixar Fest AP pins and the last one (released just 2 days after my birthday in August, hint hint pickup anyone?) is Carl and Russell! Wait, what is this zap virginity thing you speak of?? Yes, I was wondering that as well. Just a playful little statement that took a thread in a very different direction: Zapped! - My first Zap courtesy of Sami! Although, I guess I could have worded "zap virginity" a bit differently. It's not like that is my slogan or anything!! krand1276, watzshakinbacon, MerlinEmrys and 1 other person like this. Erm... anyone else think Grimsby's scarf thing looks er... really phallic? TinyTink, pretty Omi, a4matte and 2 others like this. Seeing photos of the real pins... Walt, preserve us. I want Kida and Calhoun so bad. Way more than I want Mulan. raikipins, krand1276, cadien and 1 other person like this. bcol and Ajk like this. I calls 'em likes I sees 'em. They just didn't do full justice to our girl. I wanted to be wowed. I was not wowed. raikipins, MerlinEmrys and bcol like this. I'm not sure how I feel about all the approval for a gif implying there's something wrong with me. curiousdinah, cadien, raikipins and 5 others like this. It’s been released on shopDisney online. At least the LE 5 pin set. Your screen name totally caught my eye because I grew up in Fairbanks. And we had a Malamute. Awesome! They’re wonderful dogs aren’t they. I have 2, a woolly giant red male 130lb and a sable female 120lb. Giant bears/lions basically. I have this weird feeling (based on pretty much nothing) that the surprise for the cuties set is going to be Pascal. And if it is I'mma flip a table. Whoa. I just learned about a new release from PinPics (the Solo 4-pin set). DitzyDreamer, caw caw rawr, timeerkat and 3 others like this. Those are pretty cute! Thanks for the heads up! I love those! My local store hasn't seen them and I can't find them online. If anyone has any leads let me know! That Up set is adorable!